Measure the size of the duct opening (length & width). The outside dimensions vary depending on the size and style chosen but range from about 1-1/4" to 2" greater on both length and width. For example, the typical outside measurements of a 4x10 register would be 5-1/4" x 11-1/4". Step 1: If you’re working on new construction, proceed directly to Step 2. If this is a replacement, lift out the old vent cover. Step 2: Measure the opening in your floor, wall or ceiling. The width and length of your opening should match the width and length of the inside measurements of the grille. Step 3: Please measure again to make sure you measured correctly. Step 4: Go to the product page of your choice (metal, wood, etc.). Choose the option(design/finish) that best fits your needs then choose the inside measurement that matches the width and length of your inside opening. If you do not find a size that meets your requirement please Contact Us or fill out a custom quote form for custom sizes and additional alternatives. 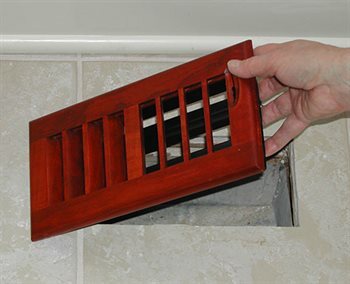 Surface Style Registers are also called “drop-in” vents, because they literally drop into the duct hole in the floor. You simply remove the old vent and replace with your vent. These are the most common applications. Flush Mount Registers may be installed into your flooring when you are initially laying the wood or laminate floor, or they may be retrofitted into an existing floor. We provide detailed instructions for measuring and installing the flush mount frame when laying a new hardwood floor. This includes measuring the duct size, determining space from wall boards and butting flooring panels to the vent frame, sanding the frame with the flooring and staining/finishing the vent to match the flooring. We provide instructions for retrofitting a flush style frame into an existing wood floor, including the option to purchase the routing bit, corner chisel and template you will need to complete this task. Baseboard and Slab style registers sit on the floor up against the wall. These may be secured to the wall in a variety of methods (screws, nails, Velcro tape), dependent upon the need and/or frequency to access the duct work behind or below the vent. Wall & Ceiling and Toe-kick registers are mounted into a wall, ceiling or inserted into a cabinet, stair riser or other framed structure. These may be secured to the wall, ceiling or structure in a variety of methods (screws, nails, Velcro tape), dependent upon the need and/or frequency to access the duct work behind the vent. These units, typically mounted on the wall or ceiling, allow easy access to change the filter because they are hinged. These are measured simply by the size of the filter. For example a filter size of 20" x 20" would require a 20" x 20" return air filter frame.